Weather, that’s what I want to talk about first, more importantly, ‘sun’ as opposed to ‘rain’. You see, in 2009 we went north for a three week tour around the Scottish Highlands. You can read about it here. Now we enjoyed that holiday quite a lot but there was a big BUT, and that was the rain. So, not surprisingly, when the question was asked where we should go in 2010 for our main holiday, my thoughts turned south; the further the better. For us the exchange rate ruled out the continent and, as there is so much of our green and pleasant land we have not yet visited, we chose two locations we thought might give us some better weather and plenty of interesting things to do. Battle near Hastings was our first choice and Wareham in Dorset the second. We planned to break up the journey with a stop at a CL near Duxford on our way south and a night in Derbyshire on our way home. The minute we leave home we are on holiday; our pace is sedate and untroubled. If we have to stop then we stop and time is of no consequence. Our journey south was steady with no traffic jams, delays or holdups, wow! Our first two nights were in a small CL not far from Duxford and the temperature rose to 33ÌŠ. ‘A little bit different to last year’, I thought and I waited with baited breath for the rain to catch up with us but it stayed sunny. Our first full day was spent at Duxford IWM Flying Legends Air Show. I had a fantastic day watching and photographing the planes as they carried out their displays. So absorbed was I, that I took little notice of the sun, which was so strong, it left me with sunburn down one side. But, who cares I had some sun! The next day we packed up and headed further south to our first main stay. Once, many years ago, Normanhurst Court was a fine mansion house. And to go with the fine house and its stables, terraces, courts and walled gardens the owner had a fine Victorian garden designed and planted. This included specimen trees imported from all over the world. The house’s fortunes (and those of its owner) dwindled and, after the Second World War it was demolished. The gardens and grounds however, remain. Step in the Caravan Club, who have created a most wonderful site here which is sympathetic with the garden and its surroundings. Our pitch, in “honeymooner’s corner”. We hadn’t even brought our flag! The site has 149 pitches some grass, some hard standing and some very hard standing. 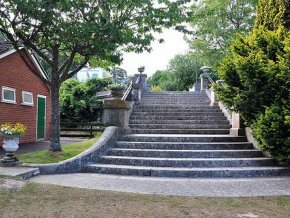 There are two facility blocks, a large children’s play area and numerous walking paths that lead you out into 1066 country. On your arrival the warden will give you a map then ask you to park your unit and walk around the site to pick your spot. You see, the site is full of cul-de-sacs with areas known as The Terrace, Stables, Ha Ha, Courts, Upper and Lower Pines, Oaks, The Paddock and many others. There are so many we missed some on our reconnaissance lap. We did however, find a first, second and third choice. Once we had picked our pitch we informed the wardens. It was of course in a cul-de-sac and right at the end, nestling under trees. The warden smiled and said, “We call that honeymooner’s corner”. “Oh!” I replied, and she laughed at my embarrassed face. Set up was quick and easy despite the slight slope on the pitch. As I explained, there is a mixture of pitches but nothing too drastic (in terms of sloping ground) that a couple of levelling blocks would not sort. The steps to the Facility Block are splendid. The facility blocks were very clean and tidy, each with a washing up and vegetable preparation area attached. There was also a laundry room.The steps leading down to the lower facility block were the most splendid I have seen anywhere. Normanhurst is situated just outside the rather nice town of Battle which is famous because there was some sort of ruck here way back in 1066. There is a small supermarket for your essentials, but if you want a big Tesco/ Sainsbury’s then you will have to travel six miles or so to Hastings where they have both. At Battle is Battle Abbey with its grounds encompassing a very good ‘1066 trail’ which also leads you around the town with information points at various locations. Some of the locations give you great views across the town itself. Ightham Mote brought back memories. 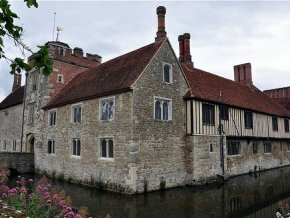 When I was a child (some 30 plus years ago) I went on a holiday to Kent to visit my aunt and cousins who used to live in one the cottages at Ightham Mote. It was a true, childhood dream holiday. So my return here was very much a nostalgic trip. It wasn’t as big as I remembered. The manor itself dates from 1320 with important later additions and including (I kid you not); a Grade 1 listed dog kennel. It is as the name suggests, a moated medieval manor house and the moat still has the water. The gardens were not as wild as I remember; they have been tamed by the National Trust. The only exception was the poorly maintained lawn. I recall that it used to be like a billiard table. It’s a wonderful place, well worth a visit. Bodium Castle is owned by the National Trust and is open to the public. Bodiam Castle is a late medieval moated castle in East Sussex. 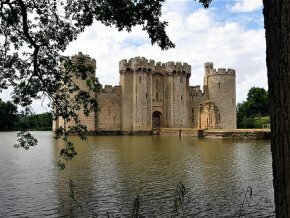 It was built in 1385 by Sir Edward Dalyngrigge who was a former knight of Edward III, with the permission of Richard II; ostensibly to defend the area against French invasion during the Hundred Years War. It’s basically a square castle with towers at each corner and gates at the north and south. The northern gate was the main one. The main defence of the castle was its huge moat which is now filled with huge carp that surface to view the tourists. I would not want to fall in there to be fish food. The castle is protected as a Grade I listed building and a Scheduled Monument. It has been owned by The National Trust since 1925 (donated by Lord Curzon on his death) and is open to the public. Scotney Castle in Kent is a country house with beautiful formal gardens. 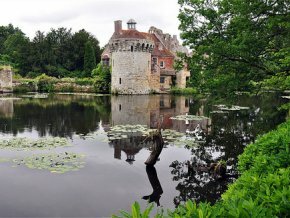 Within the gardens and on an island in a small lake, are the ruins of a medieval, moated manor house called Scotney Old Castle. It is very picturesque and some would say, romantic. The lake is surrounded by sloping, wooded gardens. At the top of the gardens stands a house which was built between 1835 and 1843 to replace the Old Castle. This is known as Scotney New Castle or simply Scotney Castle. Following the death in 2006 of the then resident, Mrs Betty Hussey, the house was opened to the public for the first time (in 2007). The house is set out as it would have been on her wedding day. Indeed, each guest gets an invite when entering the castle. It also belongs to the National Trust. Have I mentioned the weather up to now? Well, it was sunny most of the time, but occasionally we had a cloud or two. Once or twice it threatened to rain. But we stayed dry and, as we drove west, the temperature went up, the sun still shone and it looked like we had fair weather ahead of us. So it proved for another whole week, as we had nothing but sunshine with temperature in the mid to late twenties. 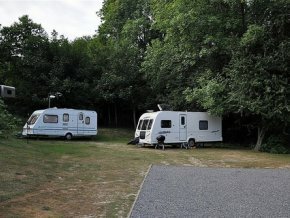 After five full days at Normanhurst we hitched up and travelled west to our second main port of call – Hunters Moon CC site in Wareham, Dorset. Header banner image credit to WyrdLight.com [CC BY-SA 3.0 (https://creativecommons.org/licenses/by-sa/3.0)], from Wikimedia Commons.